4480 Jabba's Palace is a set released in 2003 as part of the Classic Star Wars line. This set represents Jabba's palace which appears in the opening scenes of Star Wars Episode VI: Return of the Jedi. 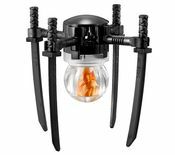 The Set contained three Minifigures and two droids, Princess Leia (Slave), Jabba the Hutt, B'omarr Monk, Luke Skywalker (Jedi), EV-9D9, and the Gonk Droid. The included accessories were a Frog, in Transparent Green, a Green Lightsaber, and a chain to strap to Princess Leia. 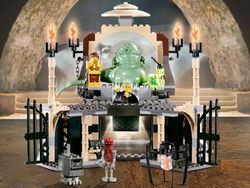 The set contains two included rooms, Jabba's throne room with a working trap door, and the Rancor pit, however the Rancor monster was not included. It can be combined with 4476 Jabba's Prize and 4475 Jabba's Message to make Jabba's Palace larger. This set saw the only appearances of Luke Skywalker (Jedi) (Hood) and EV-9D9. This is the first set to include Princess Leia (Slave), Gonk Droid, B'omarr Monk, and Jabba the Hutt. This set also appeared in the Product Collection K4480 Jabba's Palace Kit. This is a description taken from LEGO.com. Please do not modify it. Can Luke save Leia from Jabba the Hutt™? Build the palace of one of the nastiest creatures in the galaxy—Jabba the Hutt™! Jabba has captured Princess Leia™ and is holding her prisoner. Luke has come to save his friends, but he must look out for the many twists and traps! The palace floor opens and sends Luke tumbling to the dungeon below. Watch out for EV-9D9™ and her droid factory! Includes Jabba the Hutt™, Luke Skywalker™, Princess Leia™, EV-9D9™, B'omarr Monk™, and a Power Droid™. Facts about "4480 Jabba's Palace"
Can Luke save Leia from Jabba the Hutt™?